Appeals court lifts Google Innocence of Muslims takedown order. 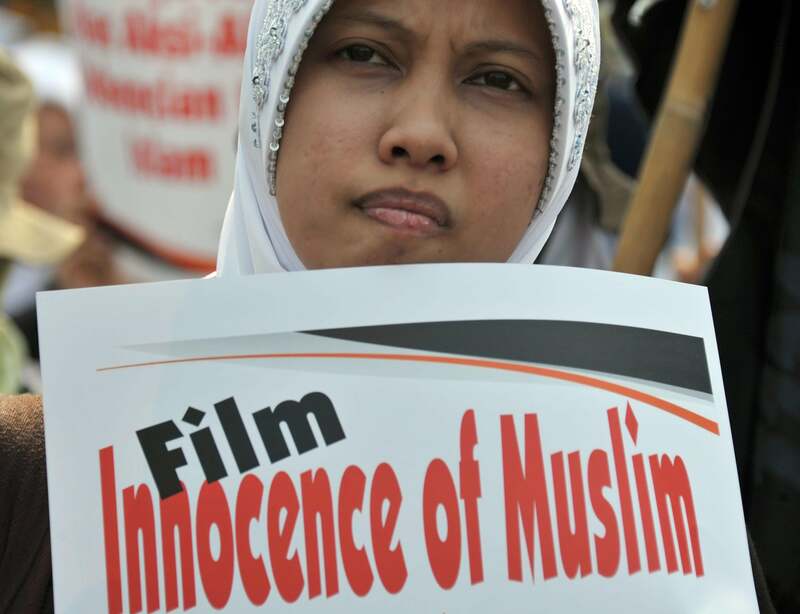 A demonstrator holds a placard during a protest against the film ‘Innocence of Muslims’ in Jakarta, on September 14, 2012. A federal appeals court on Monday overturned a 2014 takedown order that forced Google to remove the highly controversial anti-Islamic film Innocence of Muslims from Youtube. The depiction of the Prophet Mohammed in the film set off a wave of anti-American protests and violence across the Muslim world. The short film, which the U.S. 9th Circuit Court of Appeals described as a “blasphemous video proclamation against the Prophet Mohammed,” was pulled from Youtube by its parent company Google based on a claim of copyright infringement. Ms. Garcia answered a casting call for a minor role in a film to be titled “Desert Warrior,” according to last year’s Ninth Circuit opinion. She was paid $500. Ms. Garcia said she thought the film was about the life of a typical Egyptian 2,000 years ago. It wasn’t until the film was uploaded to YouTube that she saw the end result, according to the opinion. What she saw was a short anti-Islamic film called “Innocence of Muslims,” in which she was portrayed as making anti-Muslim statements. According to the opinion, an Egyptian cleric issued a fatwa, calling for everyone involved in the film to be killed. Ms. Garcia repeatedly asked Google and YouTube to take down the video but Google repeatedly declined. So Ms. Garcia sued Google and YouTube. She argued that her performance in the film was copyrightable and that copyright interest entitled her to demand that YouTube pull it down. The film’s producers dubbed over Garcia’s lines making it appear that she was asking: “Is your Mohammed a child molester?” That was Garcia’s only appearance in the movie; it lasted only five seconds. “In her initial attempts to suppress the film, Garcia sued both Google and filmmaker Nakoula Basseley Nakoula (aka Sam Bacile), saying in state court that the video amounted to hate speech, made her look like a ‘religious bigot’ and violated both her right to privacy and her ability to control her own likeness,” according to NPR. “Monday’s ruling said the takedown order—and a subsequent amended version that required only Garcia’s performance to be struck from the video—violated the 1st Amendment,” the Los Angeles Times reports. In rejecting the claim, the court noted Garcia “may have a contract claim” against the producers of the film.